Lawrence Cherono (left) and Lelisa Desisa fought to the finish, with Cherono prevailing. Only a couple of seconds separated Kenyan runner Lawrence Cherono and Ethiopian Lelisa Desisa as they sprinted down the final stretch of Bolyston Street at the end of Monday’s 123rd Boston Marathon. 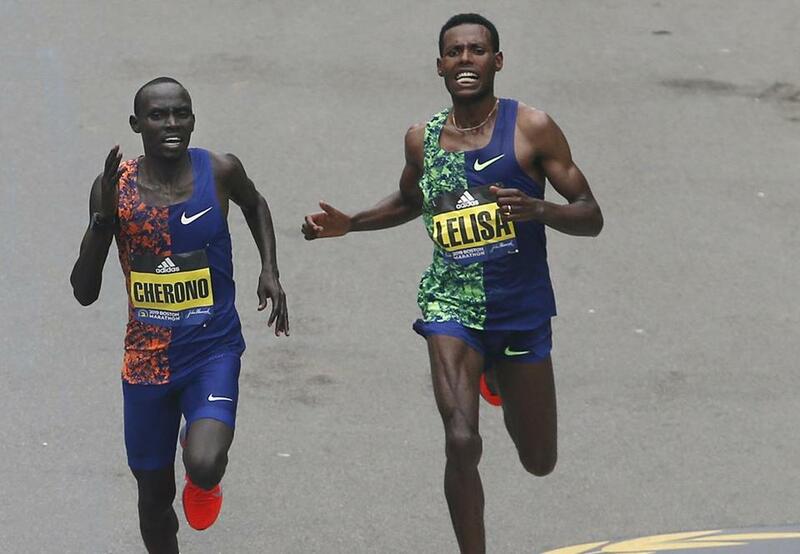 Cherono managed to pull ahead of Desisa, the 2013 and 2015 Boston champion, and win by the slim margin of two seconds. Cherono finished in an official time of 2:07:57, with Desisa at 2:07:59, and Kenyan Kenneth Kipkemoi right behind them at 2:08:07 in one of the closest finishes ever in the race. In 2000, Kenyan Elijah Lagat and Ethiopian Gezahegne Abera finished with identical 2:09:47 times, but Lagat was awarded the victory in a photo finish, becoming the 10th consecutive man from Kenya to win Boston. Kenyan Moses Tanui, a two-time Boston champion, finished right behind the duo with a time of 2:09:50. In 1988, Tanzanian Juma Ikangaa held a lead over Kenyan Ibrahim Hussein after miles of side-by-side racing. Hussein made his move down the stretch and passed Ikangaa, posting a winning time of 2:08:43 to top the Tanzanian (2:08:44) by just one second. In 1978, Melrose’s Bill Rodgers won Boston for the second time but he barely edged Californian Jeff Wells. Rodgers posted a time of 2:10:13 — just two seconds faster than Wells’s 2:10:15 — and he would win Boston each of the next two years, too.